4.5 stars. We have another winner!By the halfway point I was giddy with all of the gamer fan trivia. How flipping crazy is this that ONE scene had references to D&D, MMO's, and the 80's game Joust? It's as if the heavens opened and decided to rain awesomeness.We won't even go into all of the classic t.v. sitcoms, cartoons, movies, and technology which have been mentioned. Star Wars, Thundercats, War Games, and Atari, indeed. NERDGASM!This book is a must read for fans of the 70's and 80's, as well as anyone who has ever played a console game, RPG, MUD, MMO, etc. How could anyone not love being immersed in the subculture of today's technology buffs? The near-future involves a world where we as a people become far too immersed in a false reality - a virtual reality. Do I see this potentially happening in our future? I hate to admit this, but I'm a little afraid. Anyone who's habitually spent too much time on the internet or locked away inside of a game could probably relate to disengaging for a period from the real world. I'm even guilty of this, to an extent. I am an ex-gamer, after all. To actually see such a future played out in the pages of a book is quite scary. I hope we never get to the point where society as a whole forgets to go outside and see the sunshine. I'll be crossing my fingers and hoping on this one.All potential doom and gloom aside, this book was entertaining! Who didn't dream of treasure hunts and winning prizes as a child? The trip was one I wished I could have gone on from within the safety of my own home (without being chased by an evil corporation, of course!). I can't say that I was able to solve any riddles myself, nor am I nearly schooled enough in 80's trivia to have been able to accomplish 1/10 of the things Wade did, but it was fun to accompany him on his journey. 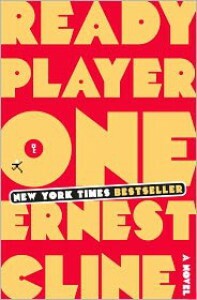 If you aren't a gamer, 80's buff, or sci-fi nerd, this book might take a few chapters to warm up to. I'd say give it until at least chapter 5. It really does start to take off into a wonderful adventure, once you start to see the contest unfold and other players step in.